Most people won’t even have considered that there might be a large trade in counterfeit auto parts. They’re just something we take for granted, especially if we work on our own vehicles. We buy them and assume they’re the real thing. Sadly, all too often they’re not. The global trade in fake auto parts is estimated to be around £6 billion a year, and that’s a very tidy sum. Someone, and not the real manufacturers, is making a lot of money. Of course, the problem hits not only car manufacturers, who supply parts to people, but also those companies whose entire livelihood comes from making and sell car parts. But far more than that, it can affect everyone on the road. In many instances those fake parts are substandard, and sometimes downright dangerous. There have been a number of cases where brake pads have been found to be filled with sawdust or wood chips – which isn’t something you want when you have to make a sudden stop. What about oil filters? They’re supposed to help keep the engine running and take bits and pieces out of the oil, to keep it smooth. That’s not going to be so easy if the filter is actually stuffed with newspaper or an old cloth. 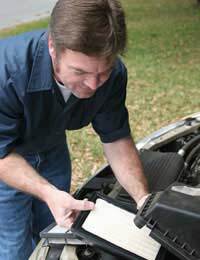 In fact, your engine could easily seize up, meaning you have to spend hundreds of pounds on a replacement. Those are just a couple of examples – there are many more. Nor are fake parts limited to things like those; almost every type of part is counterfeited these days, from belts to bearings, spark plugs to sensors. There’s even fake antifreeze on the market. If there’s money to be made, the crooks will go after it. How Do I Know My Garage Isn’t Using Them? Most of us develop relationships with garages and trust them to do the work on our vehicles properly. In the vast majority of cases, they do. But of course, we don’t ask about the parts they use – most of us wouldn’t know, anyway. They buy from their suppliers in an established chain, and it’s highly unlikely that any reputable garage would ever use a counterfeit part – their suppliers simply wouldn’t stock them. It helps if you know the person or shop where you’re buying the parts. If you’re purchasing online, especially in an online auction, be especially wary – you really don’t know who that other person is. Think about the price. If it’s too low, there’s a reason, and all too often that reason will be because the item is a fake. Look at the packaging very carefully. If there are any discrepancies, whether it’s in the thickness of the box, the colours, or the lettering (be especially vigilant for misspelt words – they’re an absolute giveaway), then think long and hard, and take the item to a garage or (even better) a dealer and ask them to inspect it. Finally, compare the new part to the one it’s replacing. Are they the same size? Does everything look identical? Does the new product go on easily? If not, consider not proceeding. You can even call the manufacturer for verification. The unfortunate truth is that it can be virtually impossible to tell a well done fake from the real thing without taking it apart. The safest course it to buy from reliable suppliers who stock genuine parts. It might cost a little more in the short-term, but it the long run it can save you a lot. Even your life.